← Where do you come from? I often use a version of Eleanor Rooselvet‘s famous quote “do one thing that scares you everyday“. It’s not that I try to do something that scares me, but something which either brings me out of the comfort zone or that I simply would tend to procrastinate. Today’s scary thing is flying together with my friend Asier and his flight instructor, Jean-Louis, to Corsica. Prior to taking the decision of joining this “adventure” about 2 months ago, I had barely made 10 flights amounting to less than 8 flight hours… in the last week I was learning with my instructor, Thierry, the basics of flight navigation, the use of charts in flight, the use of VOR, etc., in order to profit the most from this experience. It definitely feels less scary now. And then, I’ll always have Jean-Louis by my side at the time of piloting the airplane. I’m happy to be stretching the comfort zone. 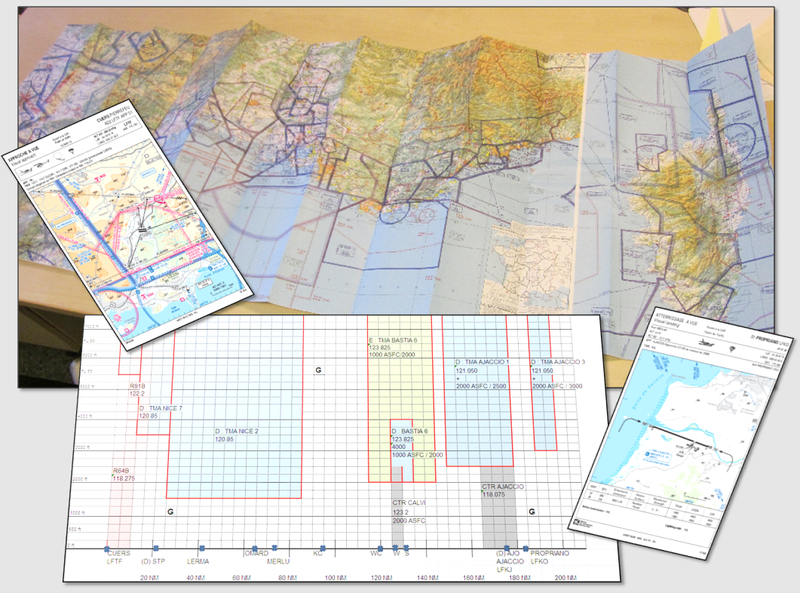 In the previous days I also learnt a lot with Asier on how to plan the route, noting headings, altitudes, radio frequencies, air spaces, aerodromes, etc. Planning the flight to Corsica. The head of the MBA I studied in Seville used to describe it as a “experiences accelerator”; in the context of flying this trip to Corsica (a group activity of the Airbus Aviation Society I belong to) really feels like such an experience accelerator. If everything goes well, we’ll be in Propriano (LFKO) before 15:00. Then we could have one or two days of visiting the island, either by car… or by plane. Ajaccio, where Napoleon was born; Bonifacio; the dolmens close to Ajaccio… I’ll keep you updated when we’re back :-).